While work on the tactical combat has been reduced to a minimum we are making great progress on the worldmap. As we are setting up all the basic features and functionalities we already have some stuff to show and a packed list of things to come next. Read more below! We now have a procedurally generated worldmap with a handful of villages placed on it and connected via a system of dirt roads. These villages manage two basic resources, health and wealth. Health: This is a measure of a villages population and their condition. Health will be reduced by fighting or getting raided by enemy forces but also by recruiting milita to defend itself. Once the health is reduced to zero the village is destroyed and goes up in flames. From now on the player wont be able to rest here or perform any other actions like hiring and trading. Health regenerates slowly over time so villages will recover eventually if getting some “peace time”. Wealth: This is a measure of a villages riches, wares and item stock. Villages want to increase their wealth by trading with other villages. To accomplish this, they use an amount of their wealth to send a caravan off to antoher village. From the ensuing trade both villages will experience a growth in wealth. The caravans that villages send out are already in the game and working. They use the existing roads and due to their heavy load are rather slow. Of course the lands and forests are dangerous and might be swarming with bandits that will attack and plunder the caravans. This is a constant risk the villages are facing and they might even call out to the player to help them if their caravans are constantly raided. They also will buy some additional caravan guards for protection if they have the means to do that. But these guards only offer a limited amount of protection. If a caravan is attacked and the gurads are overwhelmed (more on worldmap combat later as the combat is not yet in the game) the attackers take all the wealth from the caravan and take it back to their base of operations. Time passes in real time on the worldmap, not in turns. We now have implemented a day/night cycle to add to the atmosphere of the world. Of course the day and nighttimes also have gameplay effects. At night all parties movement will be significantly slowed as they have more difficulty finding their way in the dark. Additionally, the sight range is greatly reduced during the night, making it more difficult to spot enemy parties, locations or spawnpoints. So the player has to be careful when moving at night not run into any ambushes. Depending on the type of party there are creatures in the game that do not suffer from sight or movement penalties during the night. This applies to werewolves and the undead, making these enemies especially dangerous in the dark. Disclaimer to the following pic: The green circles on the pic below show the sight range of the party, they are only visible for debugging reasons. Also, the big sun and moon are only to give a better example. Finally, the caravan icon is still a placeholder. Similarly to villages there are other locations that spawn parties. So far we implemented haunted crypts that spawn a variety of undead raiders. These spawnpoints also have a health and wealth resource pool that they use to spawn (buy) raiding parties. These raiders seek out villages to attack and plunder their wealth. After a successful raid on a village they return to their spawnpoint and add whatever they plundered to the spawnpoints resource pool. This way a successful spawnpoint keeps growing its resource base that it can then use to buy even more powerful raiding parties and plunder even more resources. As you can see there is a dynamic at work that can lead to really powerful spawnpoints and raiding parties. So leaving a spawnpoint unchecked for too long can lead to “no-go areas” that are mainly controlled by evil forces and where all villages are destroyed (mind you that village destruction is not in the game yet). The following features are close to completion and will be implemented soon in the game. 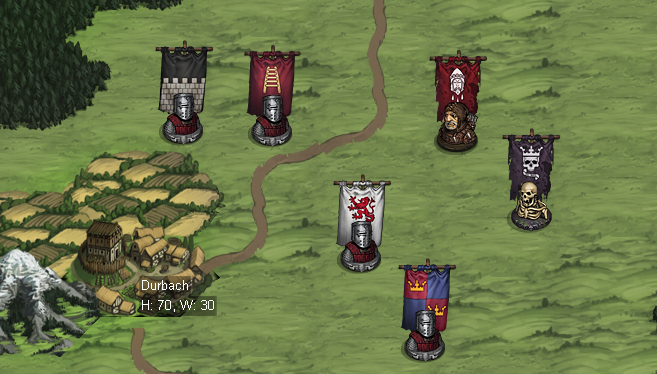 Each party that is travelling the worldmap will have a unique banner showing from what village, or any other spawnpoint for that matter, a party is coming. 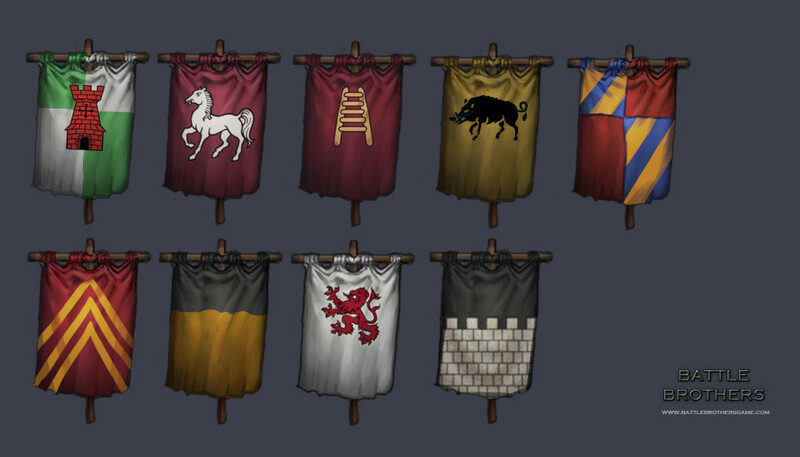 The player will be able to choose a custom banner when starting a new game. Paul already pumped out a first set of banner graphics so you can get an impression on what to expect. As we wanted the possibility of two parties fighting each other on the worldmap without a player being present (and a real tactical combat) we had to come up with a simplified world map combat system that estimates the strength of a party and calculates their chances of winning and their losses in combat. As this system is not final, we cant go into too much detail here. The combat system will account for the strength of each individual solider of a party and also takes place in turns. However, there is a delay between each round of combat to make the combat last a while and give the player the opportunity to join the fight. Once the player joins the fighting, it will continue in the tactical view just like any other fight that the player is involved in. As of now we do not have an automated combat or auto-resolve feature planned for player combat. As mentioned above villages (and other spawnpoints) should be destroyed when their health reaches zero or below. We will implement this feature shortly. Become a Bro and check out the tactical combat demo! If you haven’t done so already head over to our “Downloads” section, get the Battle Brothers tactical combat demo and give it a try! Also make sure to let us know what you think about it and how we could improve it in our Forums. Looks great, keep it up guys. Thanks man, we´ll do that! Cool. Will we be able to fight inside villages and crypts? I’d like to see those. Villages will definitely be in the game in the form of houses, fields and fences on the tactical map. With interiors like a crypt or dungeon things are a bit more complicated but the engine generally allows for it. We really want dungeons and crypt inside battles but it may not make it into the first release – well see.